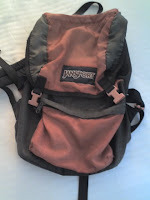 This my personal story about a ragged little schoolbag I had with me for the last 18 years. Some of my friends may have seen me carrying it around from time to time, but probably didn't know that I had it so long, even less are those who knew the story behind it. The bag was stolen merchandise, one of the things that mother had not paid for. That happened a long time ago, about when she was divorced. In those days, she had little education and no skills to provide for my brother and I. My father was a serial womanizer who had lost all his money and declared himself a bankrupt a few years before. That had exonerated him from all his responsibilities, to which he had not paid even a single cent of alimony till this day. I can still recall vividly the day mum got caught stealing from a supermarket. I was only a child of 8 or 9 years then, as I remembered this woman walking up to mum and grabbed her by the arm. She didn't say much, merely uttering a single phrase, "You're coming with me", before towing her towards the to back of the supermarket. The lady, a store detective, looked pretty stern, even though she did not look at me throughout the entire time. I had no idea what was going on and didn't understand why mum had not resisted, only seeing a defeated look on her face. That scared me and I began to cry, which had probably blown the detective's cover, given that everybody was staring at me while I sobbed, trailing behind them as they headed to the store office. That was the first time that I realised that mum had stolen in order provide for us. All those Transformers, Mask, He-Man and Lego toys that I had, were stolen just to not make us feel deprived, all that, for her little boys who had meant a world to her. I felt guilty, even at that tender age, to learn that I was the reason for her crime. I had not stop wailing even within the store office. There were a few people there, one of which was the manager who was sympathetic, seeing that she was a hapless mother with a child. They decided to let us go, but warned her not to do it again. They could have called in the police, which would have meant sending her to jail, and my brother and I, either into state custody, or of my father's, neither of which would have been a pleasant outcome. The bag was probably the very last thing she had stolen from that period of her life. I do not remember if I had ever mentioned about not wanting her to steal anymore, but I had since consciously never asked her for anything frivolous, for the fear that she would have to resort to pilfering once again. That is why I have kept this schoolbag with me, as a reminder to work hard, be frugal and be sensible with life so that we'll never have to be destitute again. Some people have mistakenly believed that I am a bloody cheapskate before, for not even bearing to replace an old tattered bag, a claim I readily admit, for I can never be sure how much it will cost to buy the lesson that came along with it. This makes me want to cry, sounds so familiar to what i have experienced. Yes, stealing, because we can't afford it. Wearing second hand cloths and get laughed at, because we were poor... I don't want to go back there no more... Thank you, now I know, I am not alone. First of all, thanks for leaving a comment and sharing a bit about your life as well. Those were the darker days of my life, and I guess you'll can probably empathise what I went through as well. Hand me downs, mockery and ridicule was the same things that I had to go through too. I hope you find some comfort from my story, and see your experience positively. It may be hard times, but the most important thing I've learnt though all of that, is that I know that I can be satisfied with whatever little I have, and still be more contended than most. You're not alone and will never be anymore. Take heart and best wishes!